The period from 2686 - 2181 BC, called the Old Kingdom, consists of dynasties 3-6. It was the time when the great pyramid complexes were constructed, with the first great achievement in the 3rd Dynasty, the Step Pyramid of King Djoser, a creation of the architect Imhotep. The 4th Dynasty was the period when the pyramids of Giza were built, under the reigns of Khufu, Khafre and Menkaure. Before them, though, Seneferu built a series of pyramids, two in Dahshour and possibly also one in Maidum (although it is usually assumed that this was intended for Huni, Seneferu's predecessor). The solar cult also reached new heights during this time, as is demonstrated by Djedefre introducing the epithet 'son of Re' in front of his name, a title that continued to be used down to the end of ancient Egyptian history. 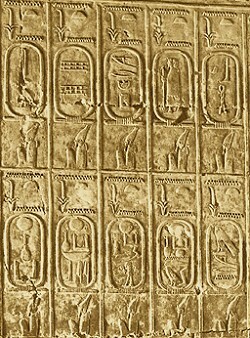 The worship of the sun reached another high point when at least six rulers of the 5th Dynasty constructed sun temples; the one in Abu Ghurab and the one at Abu Sir have been located. The royal tombs of this period are located in Abu Sir (for example Nyuserre and Sahure) and Saqqara (Unas). The kings of the 6th Dynasty built their pyramids at Saqqara. Following the example of Unas, they inscribed the so-called Pyramid Texts inside them, spells for the well-being of the dead king. Reports have also survived from this time of journeys to far-away countries, such as Nubia and western Asia. Slowly, however, the power of the kings began to dissipate, probably partly caused by economically less prosperous times. It is possible that there was also a period of famine, the result of a poor harvest, itself caused by an insufficiently high inundation. Whatever the causes of the breakdown in central authority, and scholars are still disagreeing on this point, the result was that the local officials could expand their power, which eventually led to the collapse of the Old Kingdom. Turbulent times followed, called the 1st Intermediate Period by Egyptologists.